Mountain landscapes of Meteora and the Pindos National Park. Crossing the Vikos Gorge, one of the world’s deepest. Traditional stone villages, wildflowers, lakes and mountain peaks. 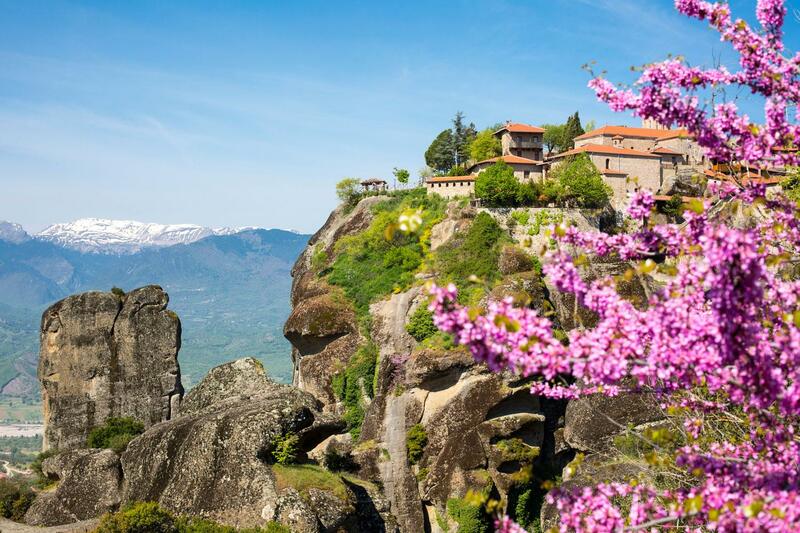 Monasteries perched on cliffs in the Meteora, a UNESCO World Heritage Site. Local cuisine such as “batsaria”, a fragrant pie and artisan cheeses. 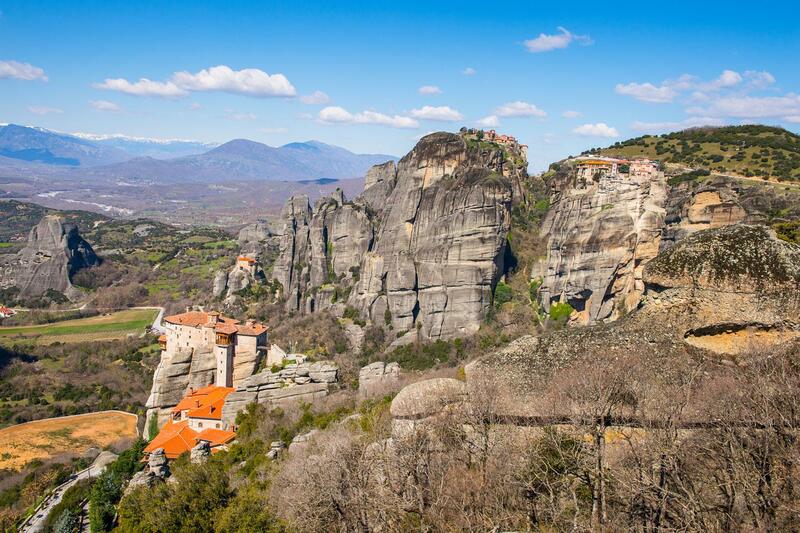 Marvel at the audacity of the Meteora monks who dared to perch monasteries on tiny summits. Sublime walks explore these unique and mystical monasteries built between the 14th and 16th centuries. 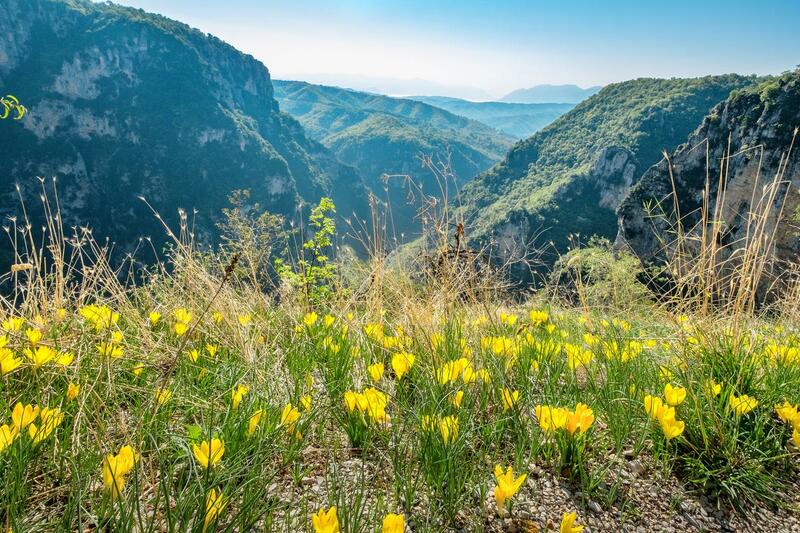 Follow pristine hiking trails through the unspoilt Zagori region of Greece which incorporates the Pindos Mountains and the impressive Vikos Gorge. Delight in following routes between traditional stone villages, crossing ancient bridges and in the delicious local cuisine at day’s end. Day 1: Arrive in Kastraki and overnight. Kastraki is located underneath the impressive Meteora rocks. A UNESCO World Heritage Site, this area has unusual and spectacular landscapes of immense monolithic pillars and hills like huge rounded boulders. Not only this but set upon these pinnacles of rock are 6 Eastern Orthodox monasteries (left from an original 24) built between the 14th and 16th centuries. They are a sight to behold and you will be seeing a lot of them on your next two days of walking. A local representative will meet you today at your hotel for an orientation meeting. Your walk today begins at the St Nicolas Monastery in Kastraki village, following the same old paths that the monks used to use. These trails wind their way through tall rocktowers and you will pass beneath the ruined Pantocrator Monastery on the north side of Dupiani Rock before ascending to the clifftop monasteries of Varlaam and Great Meteoro. The latter is the oldest and biggest monastery and was called “the monastery that was suspended in the air”. Varlaam is the second biggest, and was built in the mid 14th century. If you wish you can visit inside these monasteries before walking back downhill into Kastraki. Beginning in Kastraki, today’s walk takes you past hermit caves and the Rocks of the Holy Spirit before heading south and following the trail to the Holy Trinity Monastery. From here the views are captivating. 140 steps will take you to the main monastery where you can see 16th century frescoes and 15th century wall-paintings, should you wish to venture inside. Take panoramic trails to the Roussanou Monastery, named after the hermit who settled here, and then directly back into Kastraki village. Day 4: Transfer to Zagori and the Pindos Mountains. Today includes a private transfer (2.5H) to the Zagori region and into the heart of the Pindos Mountains. 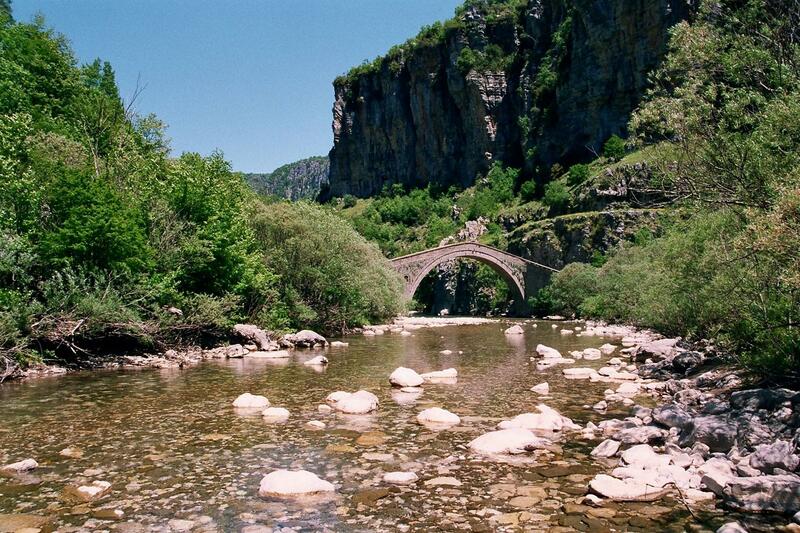 Specifically you will be staying in the village of Vitsa, located at the edge of the Vikos Gorge. One of the most remarkable features of the village are the traditional stone houses located next to each other on the slopes of the village, forming a sort of cascade. In the village square, see the huge plane tree providing shadow and the old walls dating between 2500 and 2000 BC. An included transfer of 35 minutes brings you to Tseleovo. The trail today follows old kalderimia (old cobbled mule trail) and across the plains of Vradeto to the highest village in the area. After a visit to Beloi. A viewpoint into the gorge walk to the Vradeto and down its impressive steps to Kapesovo. A transfer back to Vitsa at the conclusion of the walk is then provided. 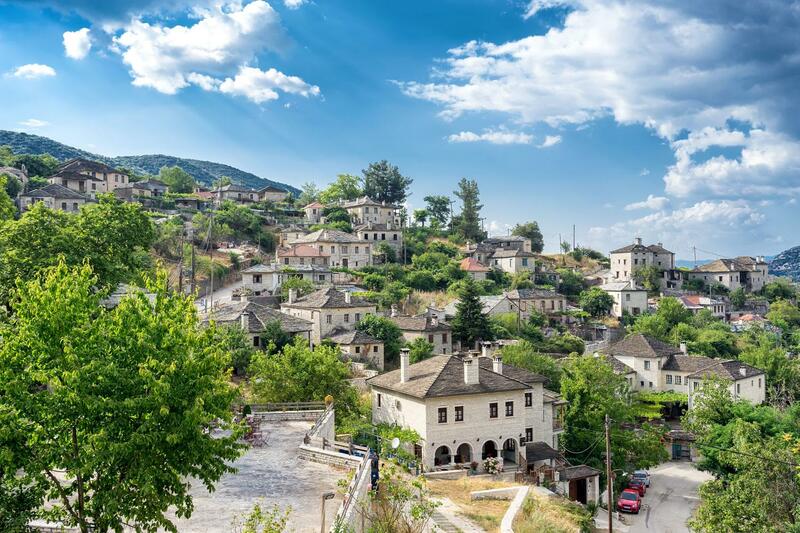 Hike through the villages of Vitsa, Koukouli, Kipi and Dilofo, villages connected by ancient bridges. First make your way down the stone steps of Vitsa and towards the beautiful village of Koukouli and Kipi before walking through a peaceful forest to Difolo. Enjoy a thirst-quenching drink in the village square before heading back to Vitsa. A transfer of 25 minutes brings you to Monodendri ready to begin your crossing of the impressive Vikos Gorge and one of the very deepest in the world. Today’s hike is a challenging, all-day hike, but well-worth the effort as you will walk next to a small river and right into the heart of the Pindos National Park. You may spot birds of prey and even wild boars. 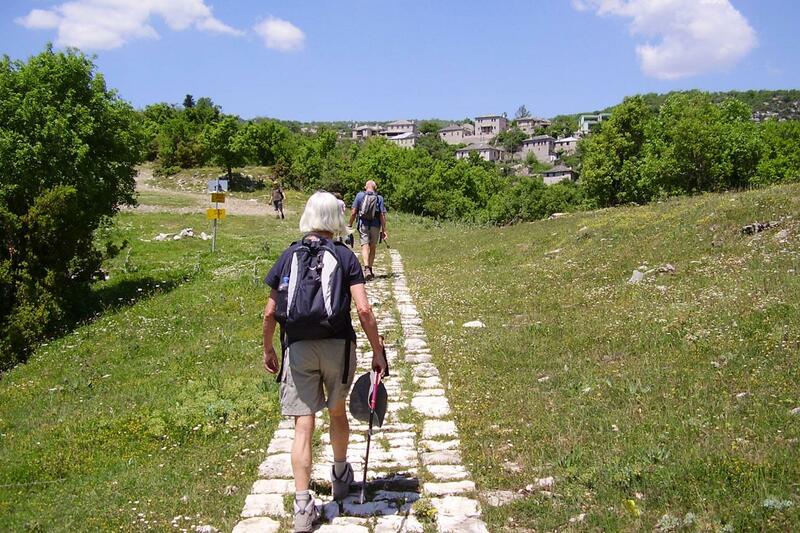 The walk finishes at Vikos Village and you will be transferred back to Vitsa. If you choose to travel in April or towards the end of October there is a chance that there will be snow in the Vikos Gorge. In this case an alternate walk through the Voidomatis Gorge will be provided. From Vitsa you can opt to take a private transfer to Thessalonika Airport or you can travel by train from Kalambaka back to Thessalonika. The accommodations provided on this tour are a mix of comfortable hotels and guest houses. Unfortunately we cannot offer this tour to solo walkers due to the remoteness of the walks. Examples of the accommodations are detailed below. This very comfortable and modern hotel is located in Kastraki village. They offer a very friendly welcome with a personal touch. This hotel has 10 spacious rooms, all with baths and fireplaces. There is a traditional restaurant with magical views over the green landscape of Vikos. Spring and Autumn are great walking seasons as the temperatures are milder. You can walk in the summer months but the recommendation is too begin walking early so that you miss the heat of the day. 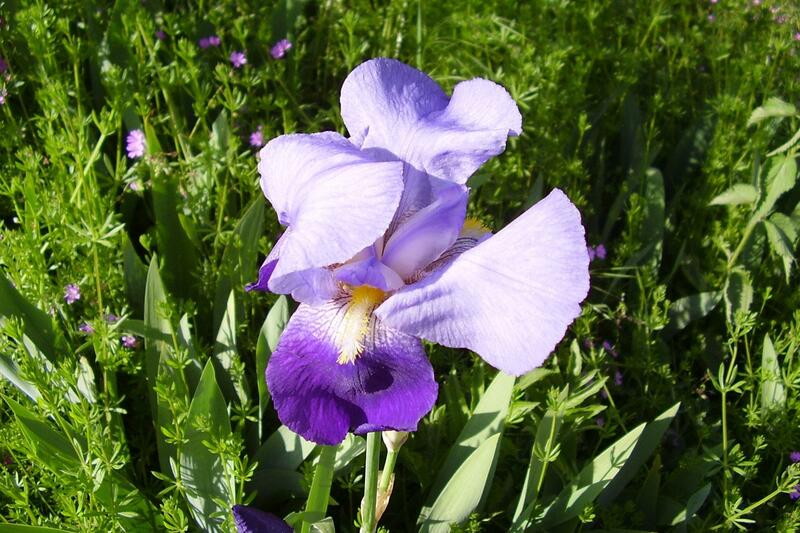 In the spring the countryside will be full of spring flowers. Please note that at the very beginning and end of the season (early April and end of October) there maybe snow in the Vikos Gorge, therefore an alternate walk is provided at this time of year. For lunches you can buy local cheeses, meats and bread in local markets and shops or perhaps stop in a taverna en route if there is one available. For dinner you can either eat at your accommodations or find local restaurants in the villages where you are staying. Your bags will be transferred with you from Kastraki to Vitsa on Day 4. We ask you to limit your luggage to one bag of up to 20kg per person. There is some way marking but generally you will have to rely on your route notes and map. GPX tracks are available on request for those who wish to take a GPS unit. This tour is graded moderate to strenuous overall. 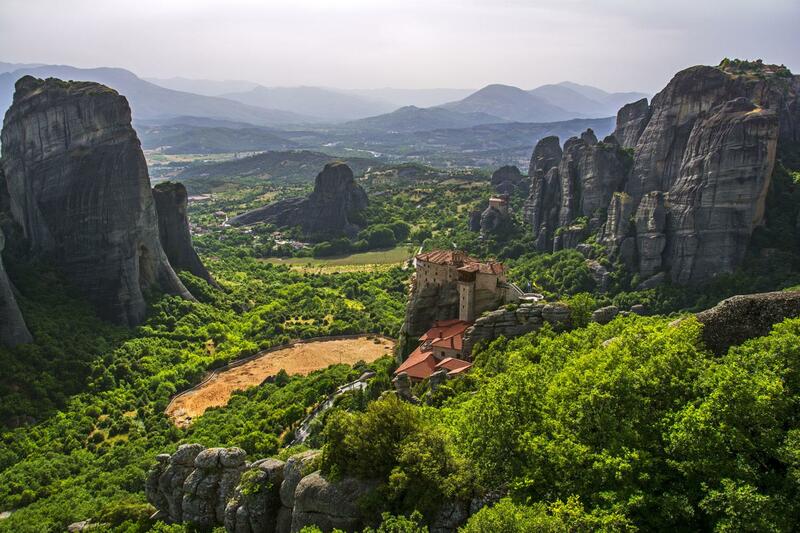 However in the Meteora region the walks are more towards the moderate side. The walks are more challenging in the Pindos Mountains. The trails are a combination of dirt trails, gravel tracks, country roads and cobbled mule paths. This tour is suitable for experienced walkers with very good physical fitness. There are elevation gains and losses to negotiate when walking up to and down from the monasteries and also up and down the Vikos Gorge, etc. The distances and are approximations of the recommended routes. Please be prepared by packing all necessary items. Your information pack has a detailed equipment list which includes the standard gear we advise. In order to get to Kastraki, the best option is to fly into is Thessaloniki Airport. This airport is served by numerous airlines including, Ryanair, Easyjet, Aegean Airlines and many more. Macs Adventure can provide a private transfer from the airport to the first hotel and from Vitsa at the end of the tour back to the airport should you wish to take this option (at an extra cost). There is also a train from Thessalonika to Kalambaka (we would then provide the transfers to and from Kalambaka to Kastraki and Vitsa as part of this option, which is the most inexpensive choice). There are several trains per day (but only one direct train). The journey takes from 2.45H to 3.30H depending on the schedule. Please check the TrainOSE website for schedules. You can also fly out of Ioannina Airport at the end of the tour as it is quite close to Vitsa, but flights out of here are limited and it is necessary to fly via Athens. Please ask us about adding transfers to and from Ioannina Airport. This tour is graded moderate to strenuous overall. 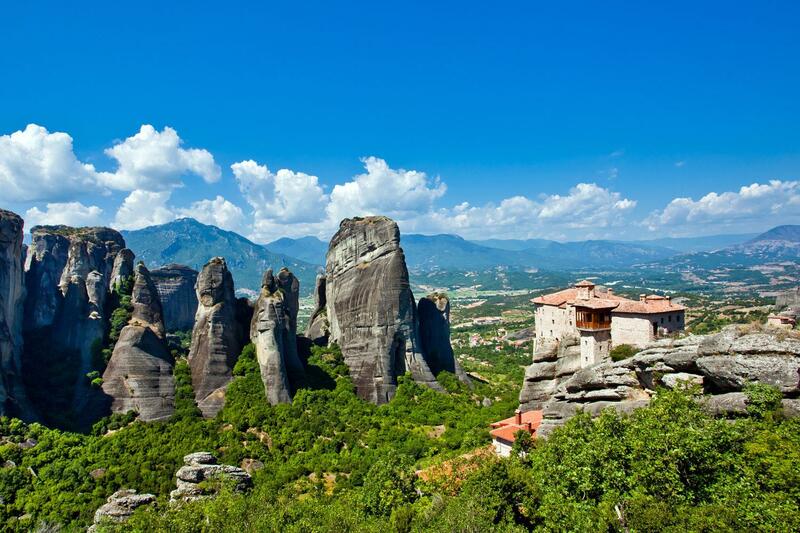 However in the Meteora region the walks are more towards the moderate side. The walks are more challenging in the Pindos Mountains. This tour is suitable for experienced walkers with very good physical fitness. We suggest you book as soon as your plans are finalised. You will need good walking shoes/boots, comfortable walking clothes, waterproof jacket and trousers, a daypack, warm clothing in the early/late part of the year and hats etc during the summer. We supply a detailed packing list with your information pack. Anytime between April and October is great to walk although it will be hotter in the summer and you may want to start walking earlier in the day to avoid the midday heat. Spring and Autumn are great walking seasons as the temperatures are milder. In the spring the countryside will be full of spring flowers. Day 2: Loop walk to the Great Meteoro and Varlaam Monasteries, 7 km. Day 3: Walk from Kastraki to Holy Trinity and Roussanou Monasteries, 6 km. Day 4: Transfer to Zagori and Pindos Mountains. Day 5: Walk from Tsepelovo to Kapesovo, 12 km. Day 6: Old Villages and Bridges of Zagori, 12 km. 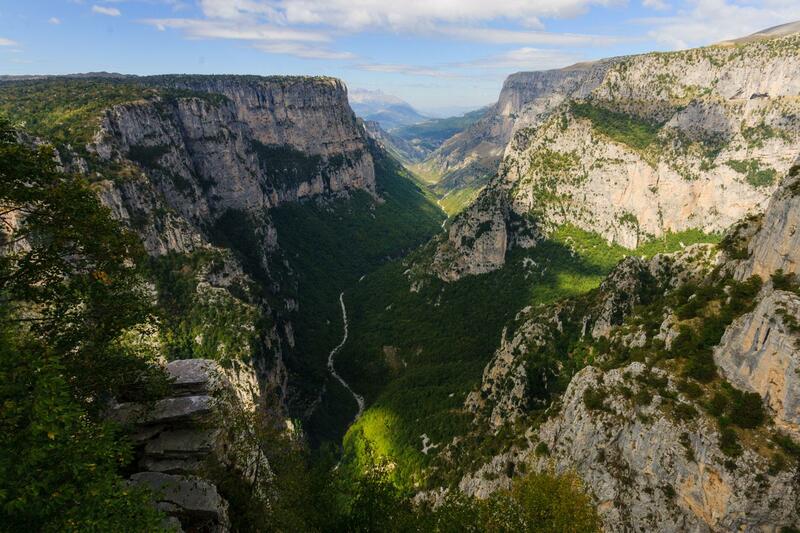 Day 7: Walking the Vikos Gorge, 13 km. If you like being immersed in unique and unspoilt mountain landscapes and discovering the “real” Greece, then this tour is for you. This tour is graded moderate to strenuous so you will need to have plenty of hiking experience to fully enjoy the walking. 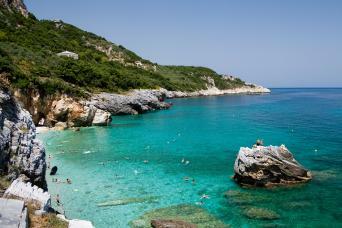 Stay in comfortable accommodations and enjoy eating traditional cuisine in the local tavernas.